Imagine being all alone on the night of the Super Bowl... Watching sports by yourself isn't just the same without friends or live in the stadium. SportsCloud is here to change that! 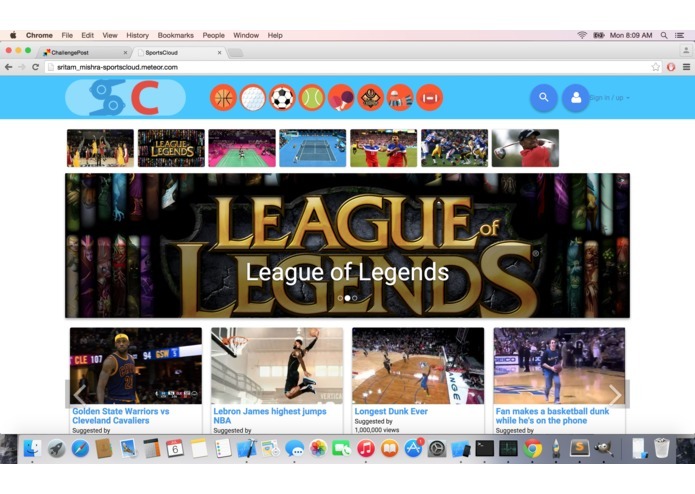 Enjoy the suspense and excitement that you would have with friends or other fans all from your computer! SportsCloud is like watching the game in a chat room full of sports fans who are watching the game at the same time. 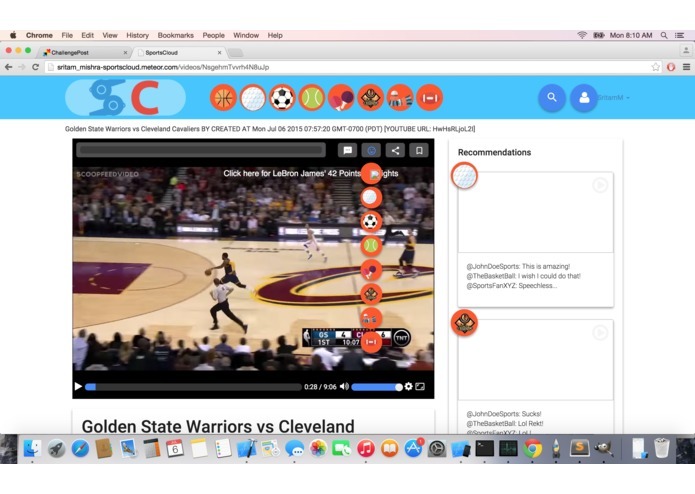 While the user is watching the sports, he can comment on his favorite parts along with other users and also see other user's comments as the match goes the on. The comments are arranged based on the time during the game that they were commented. 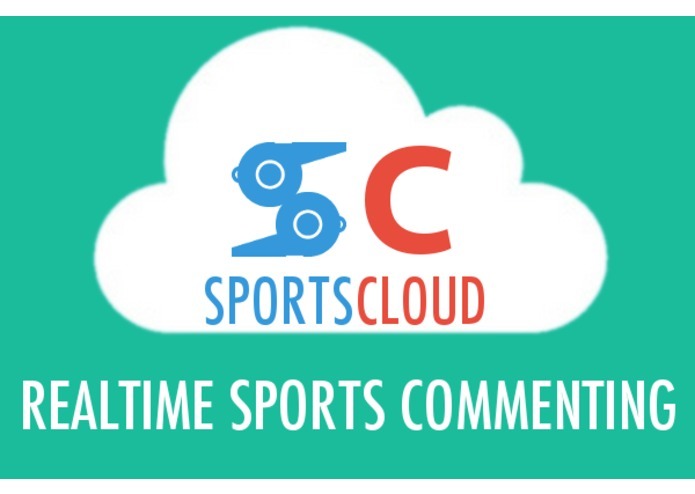 SportsCloud allows viewers to track the exact moment that other sports fans' comments are attached to the sports game. 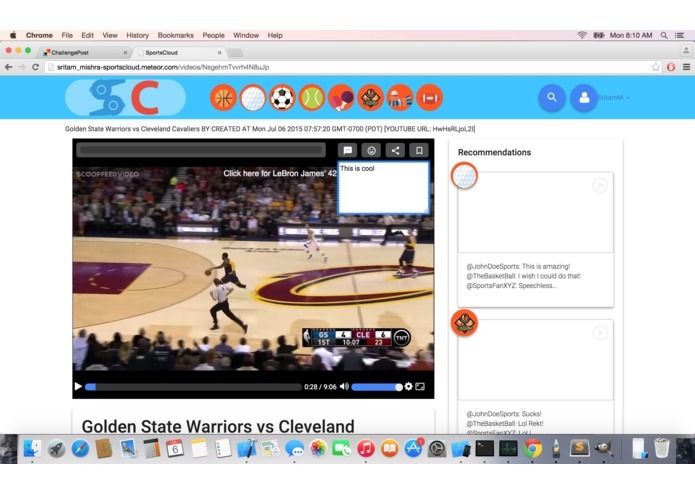 SportsCloud, then, takes those moments when a sports game is commented on and generates a live streaming feed. This feed features the time marked comments with the corresponding comments posted by sports fans. 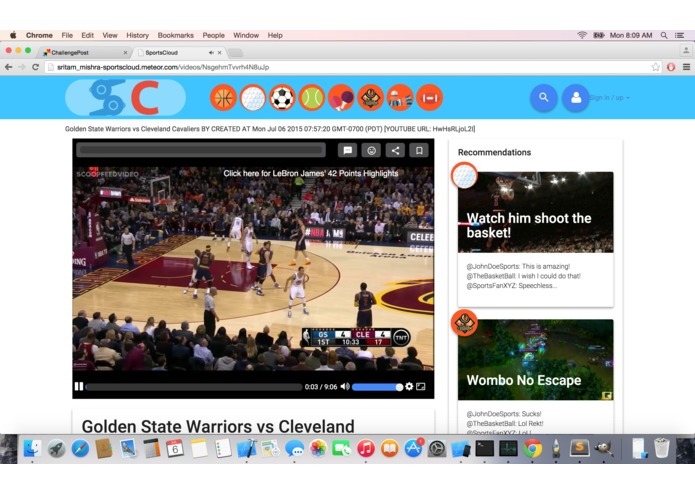 Essentially, this would be like watching the game with friends or even live in the stadium, all from the comfort of your computer. SIGN UP - Sorry for the caps, but this is a necessary step, as the application may return an error message from your browser that may say "match not valid"
Click on any topic you want in the header. There are different sports as well as an e-sport, League of Legends at the moment. Make sure you are still signed in, and click on play for the video. Click on the chat box at any moment to add a comment. 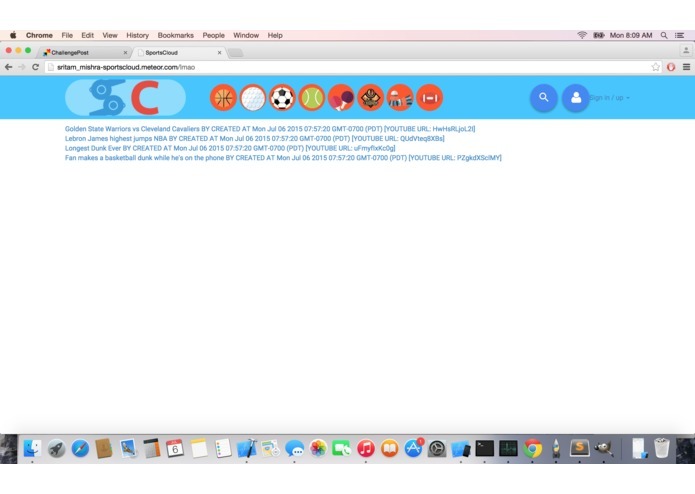 Be sure to check out all the other features in the video and explore the website itself! Along with the fact that I am a high school student, this was also one of my first meteor apps. Also, I worked on this last minute, so I was lucky that I was working on another project with meteor.js which had a similar design, so I didn't have to make a new meteor application from scratch. Since this was done last minute, there are some bugs that are very troublesome to fix. In my opinion, its been one of the best ideas I have had to work with. I had other ideas such as a feed filter for athletes to give them the best positive feed or a VR representation of sports at stadiums, but I realized that those aren't very innovative, and that's when I saw SportsCloud. Also, its my first meteorjs app for a hackathon! Finish up some UI improvements. Try to fit it in into the world of startups! You must sign in to comment, I'm am still working on the "sign in with facebook", but you can still create your own sportscloud account in the top right corner. Watch the video for more information. Also, the link in the "Try it out" is the most recent and accurate version. I would like to be considered for the MLH Prize, as I am a rising junior at Lynbrook High School, and that any student 13+ qualifies to participate in any MLH hackathon, including Hack the Planet. Source code is also available on request. As a high school student, I found this project, like most projects related to servers, a bit complex but was able to do everything that was needed in time. Fixed some small bugs, and working to fix some others! Code will be available soon for those of you who want to see how it works.